This is the summary of consumer reviews for Kidde KN-COSM-IB Hardwire CO and Smoke Alarm with Battery Backup and Voice Warning, Interconnectable. The BoolPool rating for this product is Very Good, with 4.10 stars, and the price range is $30.00-$62.00. Installation of the product was quick and easy. Product was easy to install and has every feature I'd need. Product was straight-forward hard wire install. GoodProduct, easy to install, would recommend to anyone. Installation was simple & fast as I was replacing one Kidde product w/another. In addition the installation was quite easy for the do it yourselfer. The "pigtail" connector facilitated the installation. The product has a trim line look and is asthetically pleasing. Lastly, it was delivered with a battery installed...what a novel idea!!. This detector came with complete easy to follow installation directions and I'd it in and working in less than 30 minutes. The unit was easy to install. Installed them in several apartments that I own, and they work just fine. Our home was built 7 years ago and these were the detectors installed. I went online to Kidde's website and requested which unit would would work with my existing system's Smoke Detectors. Comes with the 9 volt battery installed also. Had this installed for a few months now and works just as it should. Item beeps every 25-30 seconds even after installing 2 new 9-volt batteries. When any of the smoke detectors trip, all detectors sound, and the hallway units voice alert "Fire!, Fire!". I purchased this combo smoke/carbon monoxide detector in 2001 to replace my hard wired smoke detector. 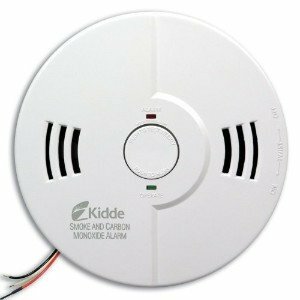 Since neither first alert or brk could supply both a photo sensor/ion wired unit AND a dual CO and smoke wired detector that communicated together, I chose kidde detectors. If my basement CO detector goes off, then the other two CO detectors also sound with an alarm and a voice indicator. I know any smoke detector will work better than no smoke detector but please take a few minutes to do some research to make sure you're using the right detector in the right spot of your home. I installed the Kidde PI2000 dual sensor detector in each beadroom and a Kidde KN-COSM-IB smoke and carbon dioxide detector in the hallways in the basement, first and second floor hallways. None of the other units (plain smoke detectors) go off with it or ever have, and we've never experienced this with any prior smoke detectors or CO detectors. Brk also had limited options in dual sensors or combo CO detectors in a wired setting. Please do your research when buying smoke detectors. Apparently there's a new California law requiring Smoke/CO2 detectors in the bedroom hallway and smoke detectors in each bedroom. and replaced batteries a second time. I replaced the batteries, which seemed to work for about a week and they all started chirping again. Replacing the batteries didn't help. What I didn't know before I replaced them with these units is that CO alarms should be replaced every 7 years. we got this as a replacement for the one that stopped working after 6 years. We needed a replacement Smoke/Carbon Monoxide Alarm, and found it at Home Depot. It starts beeping for no apparent reason when it's time to replace it. All 3 stopped working within 2 weeks ( 2 on the same day). It's now 7 years and I'd it in my mind to replace as that's the recommended shelf life, but they beat me to it - 1a.m. one starts chirping, battery backup was just replaced last month, so it appears to be the replacement warning that's in the literature. The replacement failed on installation (started sending false alarms almost immediately). Buy separate smoke and co detectors. i bought these to replace the originals in my home. Simple to remove existing alarm and replace in minutes. They installed quickly, the verbal warnings let's know if they're going off for fire or carbon monoxide, and best of all they were a lot less than buying at the local big box store. I installed this to replace my old smoke alarm to meet the new code. I purchased this fire alarm/co combo to replace a defective Firex FADCM 12000. Allowed me to upgrade home safety without installing additional alarms. I also like this alarms feature of providing a verbal alarm that incicates whether the alarm is detecting smoke (it says Fire, Fire, Fire) or is detecting high CO.